Is there anyone out there that doesn’t like big clusters in their granola? I love chunky granola so much that I can’t imagine it any other way. I used to think the only method to accomplishing big clusters was with egg whites but then I discovered that a little mashed banana works like a charm. 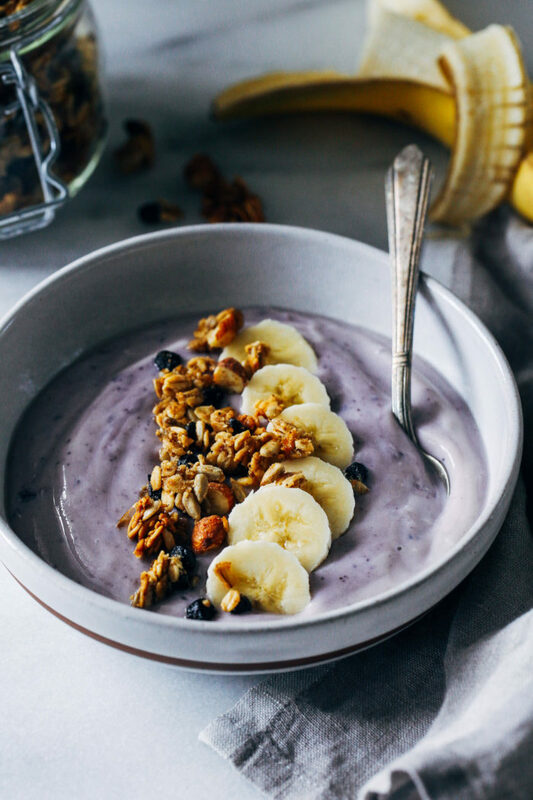 This Chunky Blueberry Banana Granola is made from a base of mashed banana with almond butter and a touch of pure maple syrup. 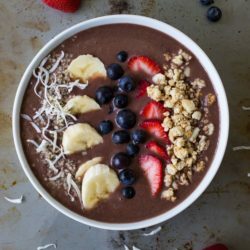 Then rolled oats, chopped roasted almonds, sunflower seeds and dried blueberries are added for a wholesome combo that’s packed with protein, fiber, vitamins, minerals and antioxidants. So basically the only thing that’s missing is the kale. 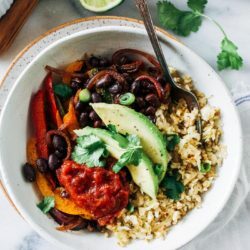 The best part is that everything gets mixed in one bowl so it’s super easy to throw together. 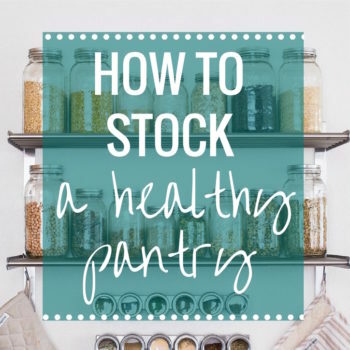 If you have a well stocked pantry then you probably have pretty much everything you need to make it too. Except for the dried blueberries. Those can be harder to come by sometimes. I personally like this brand because they’re naturally sweetened but Trader Joe’s also sells some which I believe you can buy unsweetened. Don’t quote me on that though. So in order to get super chunky clusters, you have to press the mixture together on the cookie sheet so that it bakes as one piece. Halfway through the cooking time, you give it a gentle stir (just a few times) then let it cool without stirring so that it stays in big chunks. That’s it. Pretty simple! Preheat the oven to 275°F then link a baking sheet with parchment paper. In a large bowl, use a fork to mash together the banana with the almond butter, maple syrup, vanilla extract and salt, until smooth. It’s okay if there are a few small bits of banana, just try to get it as smooth as you can. Next add the oats, cinnamon, sunflower seeds, chopped almonds (or whatever seeds/nuts you prefer) and dried blueberries to the bowl and stir everything together. Pour the mixture onto the baking sheet and pack it together with your hands in a large rectangle. Transfer the baking sheet to the oven and bake for 50 minutes, stirring the granola half way through. Baking it for 50 minutes should result in a somewhat crunchy texture. 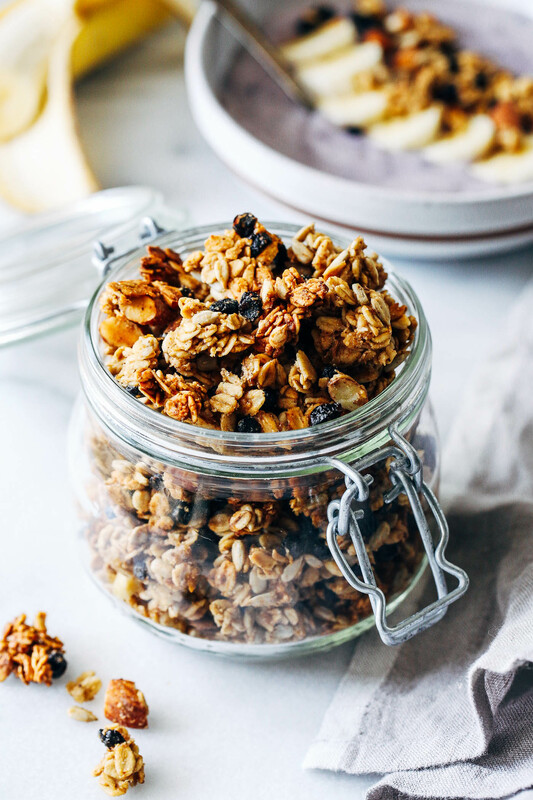 If you rather have a less crunchy granola with more flavor, then feel free to cook it for a shorter period of time. 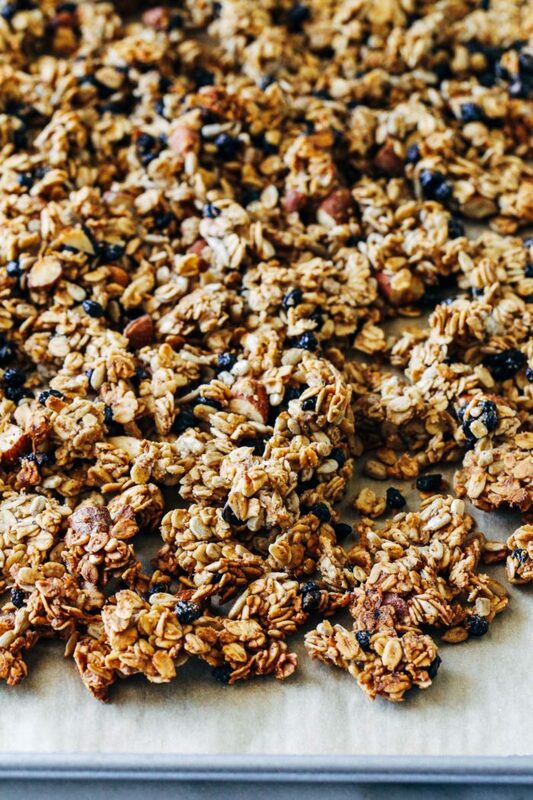 Allow to the granola to cool for about 20 minutes then transfer to a large bowl or container for storing. 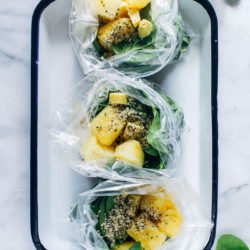 Serve immediately or store for later. 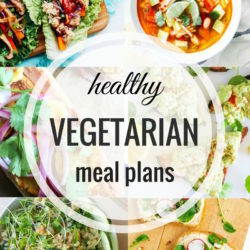 It will keep in an airtight container for up to 2 weeks. I love granola and I definitely like the chunks. This version looks so good! TJs has all kinds of dried fruit, so I always check there first when I’m looking for something. I’m a mega fan of monolithic chunks in my granola, and I didn’t realize you could get there with banana and nut butter! I’m in LOVE! The almond butter-blueberry-banana combo is slapping me silly right now. 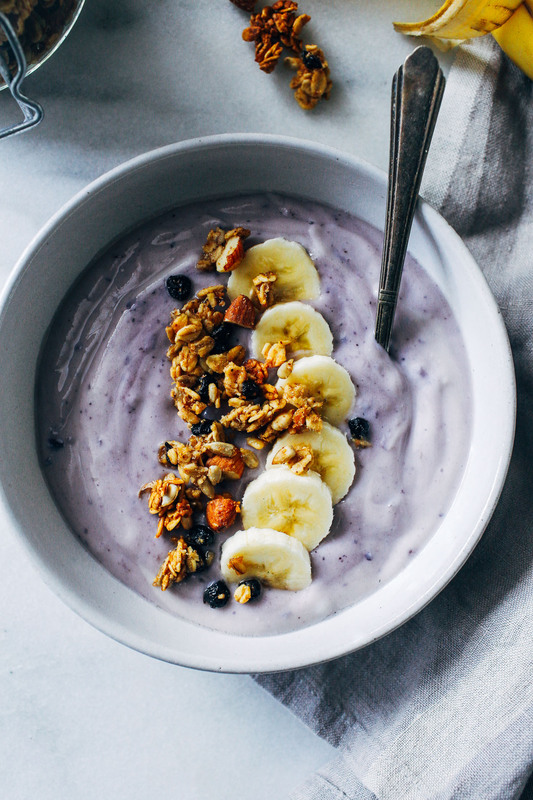 I need to make this for my next go with homemade granola! 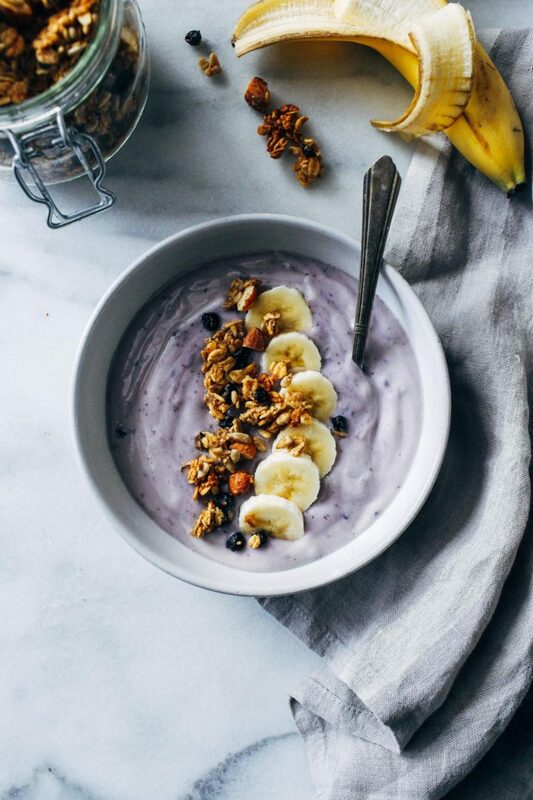 This granola looks amazing and I love the chunkiness! 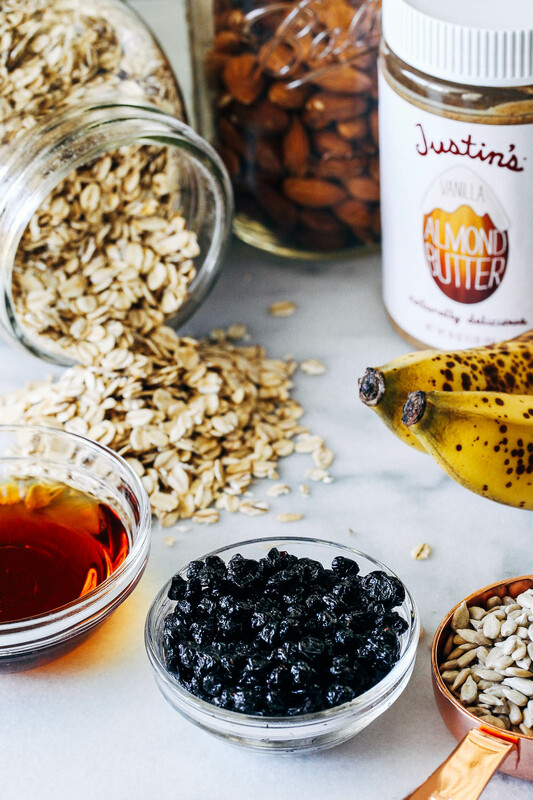 I have been obsessing over Trader Joe’s Almond Butter granola, and I didn’t realize it was the nut butter that was getting it all clumpy and amazing. Love this flavor combo! I love dried blueberries in granola!! Also whatever that smoothie/yogurt base is looks SO bomb! YES I love my CHUNKS! these look super crunchy too. My mom is a granola FIEND. Wish I could ship this to her! I like those big clusters too! I must confess that I use coconut oil in my granola, but if there’s a way to get around that, I’m down with trying it. I have everything I need for this except the sunflower seeds, so I’m trying this! You could sub honey if you don’t like maple syrup! I love clumpy granola so this looks delicious, Sarah! YUM! 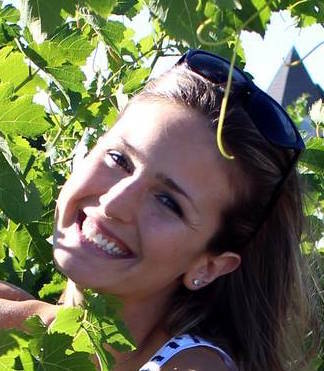 Getting ready to make now – sounds so good – but am I missing it? I don’t see what temperature to bake at. Oh no! I’m so sorry for leaving that out. It’s supposed to be 275°F. Thanks for the heads up, Carolyn! This looks delicious! 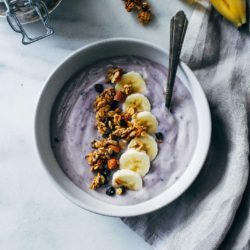 Considering how much I love bananas and any baked good containing them, I can’t believe I’ve never used bananas in granola before. And bonus that they help to make it chunky too! They make for the best clusters! Thanks Chelsea! Yummm I love homemade granola! 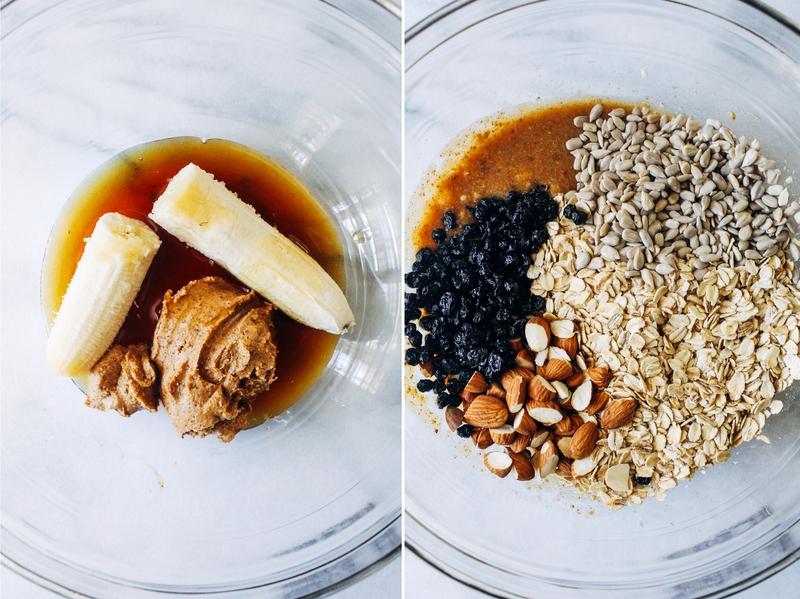 I also use nut butter to make granola at home a lot, but I like the idea of using banana too. I use banana in so much of my baking, so why not in my granola?! It works so well to create big clusters!